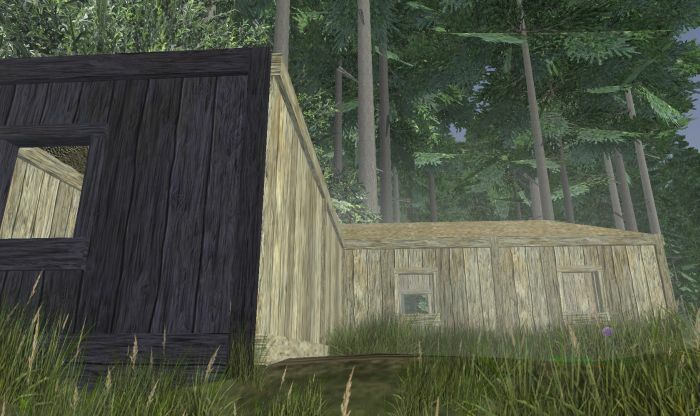 Shack On A Hill #WurmOnline – Nomadic Gamers, eh! It took a few hours, but after a lot of hard work (and I do mean a lot) I managed to get myself a house built. It sits on top of a hill overlooking Darkpaw Harbor (the deed I share with Petter) and I love every inch of it. To give you an indication of just how much work goes into building something like this. First you need to flatten the ground that you want to build on. This involves a lot of moving dirt around, digging, flattening, making four sides of a square even with other sides that touch it. It is annoying work and it took me a few hours to flatten the top of this hill enough so that it was usable for a building. I learned a lot by reading the wiki and I’m thankful for that, even if I did have to draw little pictures of the area to figure out what I was doing. Once you have the land flat, you need to plan the building. This relies on your carpentry skill. Thankfully with all of the building on Petter’s house that I had done the day before, my skill is already at 23. At the time that I started my own house, it was 18. Just enough for a nice sized home. You need large nails and a plank in order to start construction. First you plan out the house, then you secure the walls, any doors you may want, and windows. Once that’s done you use 19 planks per wall (so a total of 20) to erect the final building. That’s a lot of planks, which of course has a process involved in creating them, too. It’s difficult to tell from the picture, but there are two camellia bushes planted under the right hand side windows, and there is a small patch of onions growing on the left hand side. I’ve planted some wild flowers around, and I’m working on filling in the areas surrounding the house with trees. I haven’t put up a floor yet, that’s a job for another day, and involves MANY many planks. Now that I have a building set up, I can work on other things – like a bed. A bed will give me sleep bonus, which is something I’d really like. I’ve also been working on the land surrounding my deed, it was covered with sand in odd patches along the property, so I’ve been working on cultivating that back into forest, flowers, and bushes. It’s a slow process but the end result should look very nice. I’ve done a little research into religion, there are (edited) three Gods on the Freedom servers, and now that my house is built, I’d like to become a follower of Fo. This involves a lengthy process and I need to find a priest of Fo in order to be converted – or get a statue built, and find a follower. Fo is the deity of farming and gardening, and becoming a follower comes with nice perks – and becoming a priest comes with a lot of pretty hefty drawbacks, such as being unable to mine or cut down trees. There are lots of upsides to becoming a priest as well though, and eventually, with a lot of time, I think it would be neat to explore. The game certainly isn’t for everyone, but the side of me that craves, and thrives, on sandbox MMOs is in heaven. Now it’s time to do more exploring and see what trouble I can get myself into. As always, happy gaming, no matter where you find yourself! One correction; there are 3 religions available on Freedom. Libila [Black Light] is only available on the Epic server cluster, so you can pick from Fo, Magranon or Vynora on Freedom. I really need to read the wiki…I haven’t got the slightest clue exactly WHAT you can do in this game.